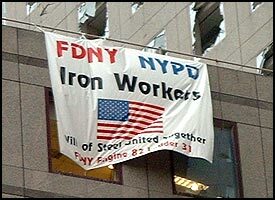 "Workers from Dozens of Unions Play Key Role in NYC Attack Aftermath"
CHAMPAIGN, Ill. — Let us now praise the men and women who punch a time clock and go to work in work clothes and helped bind the wounds of New York City after the attack on the World Trade Center, says University of Illinois labor scholar Ron Peters. Laborers, ironworkers, seamen, teamsters, electricians, steamfitters, operating engineers, longshoremen – not to speak of the firefighters and police who battled the catastrophe – are part of the human force that has aided in the rescue, aid and cleanup since the Sept. 11 attacks. "The people who came to the rescue of the investment bankers and lawyers trapped in the twin towers are representative of the kinds of working people who are under threat of losing their jobs in the name of enhancing quarterly shareholder value or saving the taxpayer money," Peters said. "I think the media, at least, have discovered that there are people out there who are working for an hourly wage who are willing to do extraordinary things." The UI professor of labor relations has kept a tab on the workers who have volunteered their services in the rescue and cleanup of the terrorist attack. These include 1,000 volunteer ironworkers from as far away as Maine , Ohio and West Virginia who cut through the thousands of tons of rubble, he said. The Iron Workers Union set up three teams of recovery volunteers, which were rotated around the clock. They were joined by more than 1,500 operating engineers, teamsters, carpenters, electricians, pipefitters, ironworkers, tunnel workers and others from the construction and building trades unions. Volunteers from all 16 New York City laborers unions helped in the recovery operation, including Local 78, which specializes in asbestos handling. Thousands of health care workers, including members of the Service Employees International Union's Committee of Interns and Residents and the SEIU Doctor's Alliance , provided 24-hour emergency medical service. Victims of the attack were treated by volunteers from the New York State Nurses Association. Disaster response teams were dispatched by the Psychology Association union to help families and victims deal with the emotional trauma of the events, while the American Federation of Teachers developed a package of material for distribution to New York City schoolchildren. The maritime unions used ferries to evacuate people from south Manhattan immediately after the attack. Seafarers and longshoremen assisted in ferrying bodies to a temporary morgue in New Jersey . Teamsters from Detroit and Memphis , Tenn. , arranged and loaded vital cargoes of food and water, and the Bakery, Confectionery, Tobacco Workers and Grain Millers secured 20,000 paper face masks for rescue workers.